In our current project we are making a movie trailer, we have to create a trailer that captivates our audience. 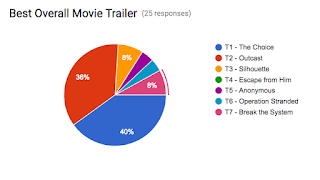 We have to base this trailer on a movie that we make up, each team has to create the name of the movie and make a poster that relates to the topic of our trailer, then they have to finish a movie trailer plan, and they have to film the movie. Our team chose to make a trailer for a movie we called, Break the System. Our movie is about a town where the gap between the poor and the rich is widening extensively, there is a test of bravery, strength and mind power. The goal is to endure several death defying feats to retrieve a ring that brings fame and fortune to the winner. Cunning and brave Kaile, is selected for the test. While going through obstacles she forms a group of friends and they devise a plan to over-through authority. I helped my team by being a character in the trailer, I also helped to come up with some things in the trailer. In our current project to make a movie trailer for our own movie there has been many challenges, but even though there were a lot of challenges there were also many successes. One challenge we had in our process was when one of our team mates were sick for a while and she could not attend school and our team meetings. We were not able to film her parts in the trailer, or record her audio. Another challenge we faced in the process was when there was only three of us at the meeting when we were planning to have four of us at the meeting. But some of the successes we had were when we filmed most of our scenes in the little amount of time we had to meet. We were also able to create our first movie poster on time. We got all the audio done as well. Even though we faced many challenges so far, and we are probably going to face more, the successes outnumber the challenges. And if we did not face the challenges, we would not learn what to do and what not to do in certain situations. Our teams movie trailer was viewed and critiqued last week. We were tied with team three for third place in the end. 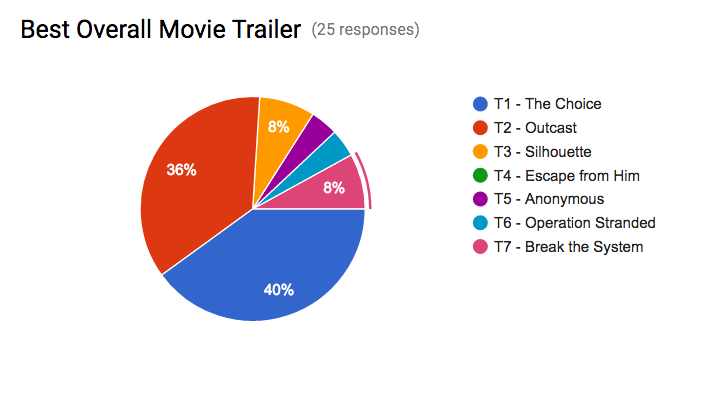 My team should be proud of our movie trailer as well as our results. We worked hard on our movie trailer to get it done and turned in on time. We should be proud of our ending results and how hard we worked. All of our work paid off in the end. Me and my teams project goal is to succeed at creating a presentation to show me and my teams two best metamorphosis animation story's to the class. 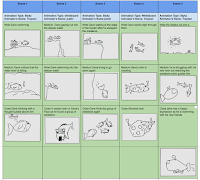 We want to make sure that our presentation explains our goal for our animation well. 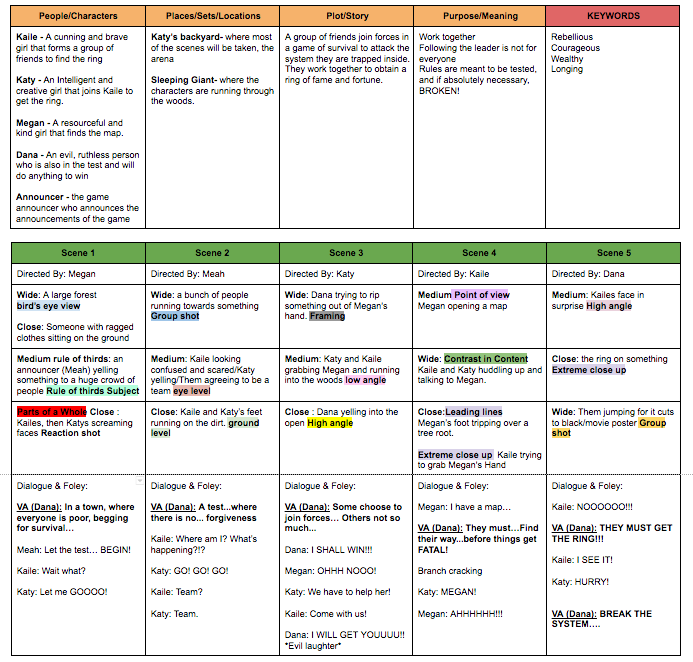 We will put as much detail as we can so that both stories seem interesting to our classmates. Then we will show it to the class and they will decide which animation will be better and more interesting. 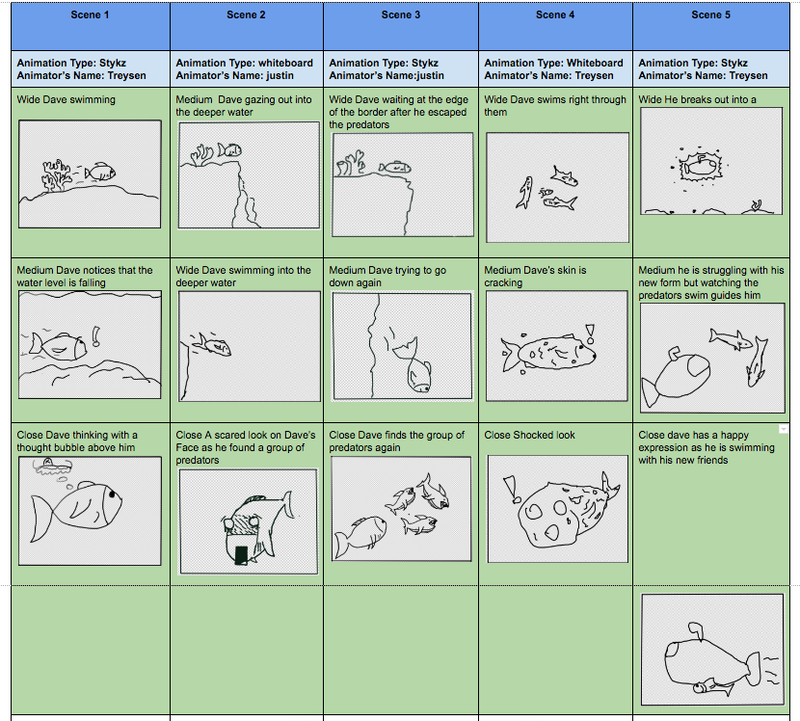 We will then make a animation plan that explains everything we want to do for our animation. Then once we have our plan we will produce a animation in which our plan will help us. My team is currently starting to create an animation that contain five main scenes. Each scene contains our main character, Dave, who is a curious fish who wants to explore the ocean and see what else it can offer to him. The first scene is about Dave who lives in the shallow parts of the ocean and feels that everyday he sees fish swimming out in deeper water he gets a stronger erg to just begin swimming out to join them. He feels as if the shallows are getting to crowded, small, and boring for him. So, that leads to the next scene were Dave decides to swim out to the deeper water to discover what else the ocean can provide and what he is missing out on when he is just staying in one place his whole life. Now in scene three, Dave spots three sharks and gets scared, he just does not feel as if he has the courage, because he knows if he goes deeper he might have to face bigger challenges one day. In scene four, Dave gathers his courage and decides if he does not even try to go out and do that, he wont be able to face or have the courage to go live his life to the fullest in the deeper water, so he decides to go, and he swims strait through them. Now in our last scene, Dave is swimming into the deeper water, and he notices his skin starts cracking, and he realizes he is slowly starting to turn into a submarine. He then discovers he had it in himself the whole time and that he just had to come out of his shell. Our animation seemed to be pretty successful. We created an animation of an fish who learned that he should come out of his shell and to live his life to the fullest. At first I was a little nervous about showing my teams animation to the whole class, while it was playing I was really nervous, although when it was done it was not as bad as I thought it would be. For our overall animation we got a 3.6, in which is actually really good. Also, for our creativity, originality, and execution we got a 3.4, on our characters, props, and backgrounds we got a 3.6, and we got a 3.2 for our clarity, understanding and message. So we did not do to bad, we actually did really good. I really like our animation and hope everyone else does too. Are facial expressions universal? Well a lot of people argue about this topic, and I personally believe that everyone have feelings, so their facial expressions are all reacting to some kind of feeling or emotion, but again the question is if everybody has the same facial expression when feeling the same things. In my opinion facial expressions are universal because facial expressions come automatically, facial expressions are something that comes naturally to all people. But some people handle things different ways and think differently of different things, so their facial expressions can seem different sometimes. In our project we are using the photoshop app. The first thing we did was use photo booth and take a portrait of ourselves that was symmetrical. The next thing we did was add the picture to our photoshop app, and center our face as good as we could. And then we added a background layer that was colored white. 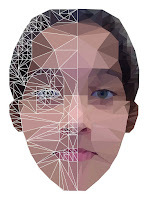 Then we used the line tool to outline our face and merge the layer in to one and call it outline. Then we outlined our mouths, eyes, nose, and hair, and put into different layers. Then, still using the line tool, we made triangles all over our face, making sure to stay on the grid. Then after that we merge all the layers we made using the line tool into one. 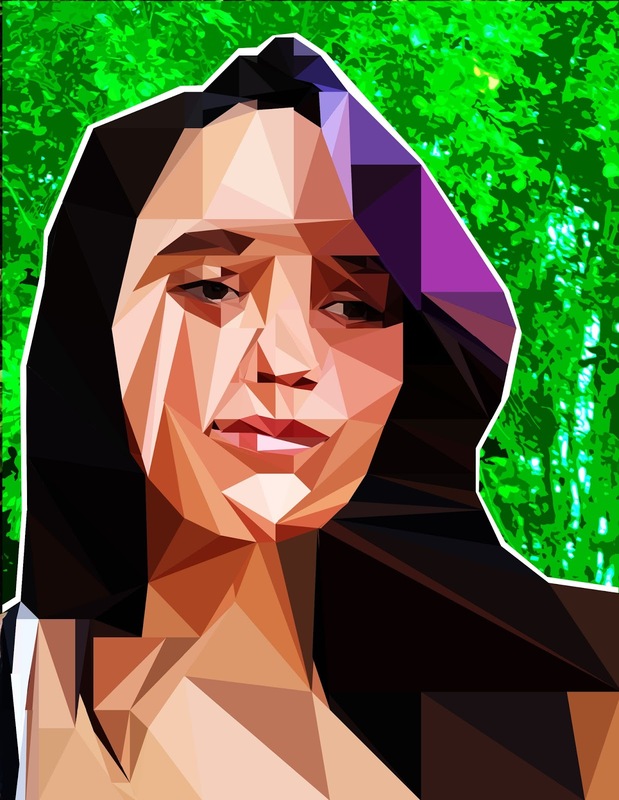 Then we color, we trace the triangles with another tool called the polygon lasso tool, and colored it. Finally we copied the same thing but flipped it over. Comparing my low poly image number one and number two. 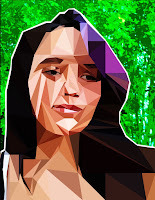 My first low poly was a self portrait were my second one was a portrait of someone else (my sister). 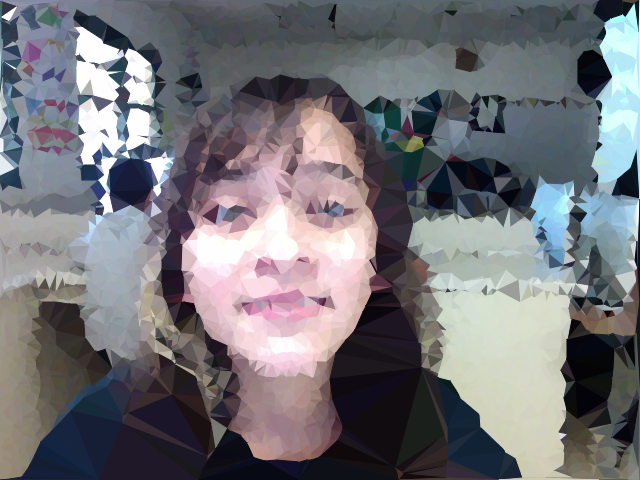 Also, my first self portrait was taken in a darker classroom with a less quality camera, while my second low poly image of someone else was taken with a better quality camera with a brighter and prettier background. And counting the actual process, the second low poly was probably more simple when it comes to the face, but the second one also has a background which is pretty hard. Those are some of the differences and here is some of the similarities. They both are made using triangles and colored in using the same colors as the picture behind it. Also, they were both very challenging projects, but enjoyable. 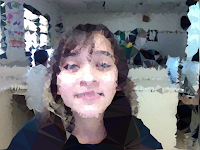 TaogoshiM_Retime from Kapaa Middle School MEDIA on Vimeo. Nature impacts my life because first it is the thing that took us to were we are now! Without nature we would not have the material to make houses, and we would not have plants or animals to eat, and we would not have water. Even if we did have those things we could not breath without plants because plants produce oxygen. So without nature we would pretty much not even exist. Well apart from that nature impacts my life because it gives me a reason to go outside, and it gives fun stuff to do other than sitting down playing video games or watching TV. Without nature and just electronics, we would probably be lazy people like in the Disney movie Wally. Well those are two of the many ways nature impacts my life. Time lapses and slow-mo's are created using a flat surface, that will not move, pointing directly at the subject for different periods of time. For a time lapse you need to record it for a long period of time, and for a slow-mo you only need to record for a short period of time. To make a time lapses or slow-mo's you also need a devise that can record time lapses and slow-mo's or you can download Final Cut Pro which is an app in which you can make your video faster, slower, or do other things with your video. The hardest part of the retime nature project we did in my period 2 GT class is trying to get a good and accurate video of different things like the sunset or "rain." It is also hard to make your video better in the Final Cut Pro app, it gets really confusing sometimes but it is kind of fun at the same time. It was really hard trying to make the video perfect. Personally, my favorite part of this project is seeing the final product, and seeing how cool it turns out to be. Also, it is fun looking and thinking how much work is put in to this when you usually would watch one on youtube and think, "That looks really easy." This is a pretty fun project, but very hard and stressful. But seeing that it is my first time, maybe if we continue to do projects like these I might get used to it and it might be more fun. For my retime nature video the most people voted for me to have a two or developing. My video had three timelapses, and two slow-mos as it was requested, so I did not get a one. I think for my poem I was not loud enough and I stopped a couple times. Also I know my first part of the video was pretty shaky. I understand why I got what I did, but I also know now what I did wrong, and what I did wright so next time I should be better. I think poetry is a way to communicate and express peoples feelings and emotion. Sometimes writing poems is a way to make people feel better or calm down. every body has their own way of making themselves feel better, and for a lot of people that way is to write or read a good poem of what they are feeling or doing. People can learn about the life of a person from a poem. Poems could be of a lot of different things for example, you could write a poem about your life or something that is currently going on. not shoes or cloths or fashion. 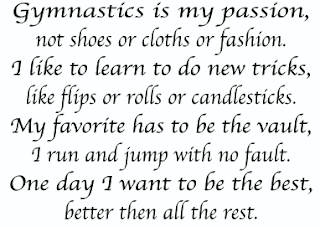 like flips or rolls or candlesticks. I run and jump with no fault. In my poetic statement I used rhythm and rhyme because with rhythm and rhyme the poem sounds more professional. Also, if you did not use rhythm or rhyme then basically you would just be writing a sentence or paragraph instead of an actual poem.